In this week’s episode, Robert and I are shocked by new research which reveals how Super Bowl advertisers spent millions of dollars and almost none had a CTA in their Super Bowl ads. We applaud Snapchat’s entry into episodic programming and criticize Condé Nast’s decision to pay journalists to create content for native ads and maintain their editorial duties. We also dig into Gap’s decision to eliminate two CMO positions in favor of a more integrated approach to customers. 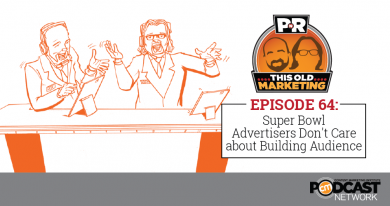 Rants and raves include my discovery of a key factor that differentiates successful content marketers and Robert’s thoughts on how Nationwide could have done a better job of executing its controversial Super Bowl ad. We wrap up the show with a #ThisOldMarketing example from Dell’s Corporate Responsibility Report. Super Bowl XLIX and the Death of Engagement (4:30): Jeffrey Rohrs, writing in the Salesforce.com blog, takes Super Bowl advertisers to task for failing to include a call to action in their premium-priced ads (which averaged $4.5 million for a 30-second spot). Most don’t seem to recognize that many consumers now watch TV with a mobile device in hand. Robert and I discuss why so many brands are ignoring opportunities to build engagement and audience during this huge event and what they need to do to correct this expensive oversight. Snapchat Creating its Own Series (12:06): Snapchat is producing a web series, according to The Hollywood Reporter. Literally Can’t Even premiered on Saturday, January 31 on Snapchat’s new Snap Channel. The 5-minute comedic episodes will debut every Saturday but will disappear after 24 hours, in keeping with the ephemeral nature of Snapchat messages. By producing original content, Snapchat is following the model set by Netflix, Amazon, LinkedIn, and others. I love Snapchat’s focus on storytelling; Robert thinks it’s a worthwhile experiment that could lead to bigger programming projects. Condé Nast Enlists Journalists to Create Ads (18:40): Condé Nast recently announced it will use its editorial staff to write ad copy as part of the creation of a new branded content arm, says Digiday. It joins a growing number of publishers that are leveraging journalists to create native ads, including Hearst Magazines, Time Inc., Say Media, and Rant Media. I share my concerns with this approach – but it’s not for the traditional “separation of church and state” reason you would expect. GAP and Banana Republic Eliminate Global CMO Roles (27:42): Gap, Inc. has eliminated its global CMO positions for the Gap and Banana Republic brands, effective immediately. This role has been replaced by a head of customer experience, a new position that broadens the CMO role to include ecommerce and aims to create a stronger, more unified focus on its customers. Robert and I agree that we’ll see more brands moving to this type of integrated, customer-focused approach – which may include moving creative and other outsourced marketing functions in-house. It’s Time to Reassess Real-Time Marketing (32:56): Scott Monty highlights Totino’s epic fail with its poorly executed Super Bowl Twitter campaign. A full 24 hours before the big game, Totino’s released all of the tweets that were supposed to be scheduled throughout the Super Bowl as part of a “real-time marketing” effort. Apparently, no one at the brand noticed the mistake. Robert and I theorize that Totino’s may have done this as a play for attention and agree that this odd execution is damaging to the brand. This Old Marketing is sponsored by the Content Marketing Awards. They are presented and owned by CMI to recognize and award the best content marketing projects, agencies, and marketers in the industry each year. The 2015 Content Marketing Awards include 75 categories recognizing all aspects of content marketing, from strategy to distribution, from design to editorial. Winners are awarded on the innovativeness of their programs and materials submitted, not the size of the company. Winners will be announced at Content Marketing World 2015 in September. The cut-off for early-bird submissions is March 27, 2015. You can learn more at http://bit.ly/1za7zC6. Joe’s Rant: Earlier this week, I published an article on the CMI blog that shares the results of the research I’ve been conducting for my new book. I discovered that most successful content marketing-driven companies put all their energy into one channel. Then, only after many months and years of success, they began to diversify their content offerings. How does this compare to our research? The average B2B marketer is using 12 tactics and three social media channels. It’s time to pare back and focus your efforts in 2015! Robert’s Rant: In a new column on LinkedIn, Robert applauds Nationwide’s gutsy choice for one of its Super Bowl ads, in which a young boy explains how he almost had an awesome, magical life – but he died in a preventable home accident. The ad encourages parents to visit a website called MakeSafeHappen. But he believes the company missed three opportunities to create value for its customers. Robert and I discuss what marketers can learn from Nationwide’s flawed execution of this campaign. 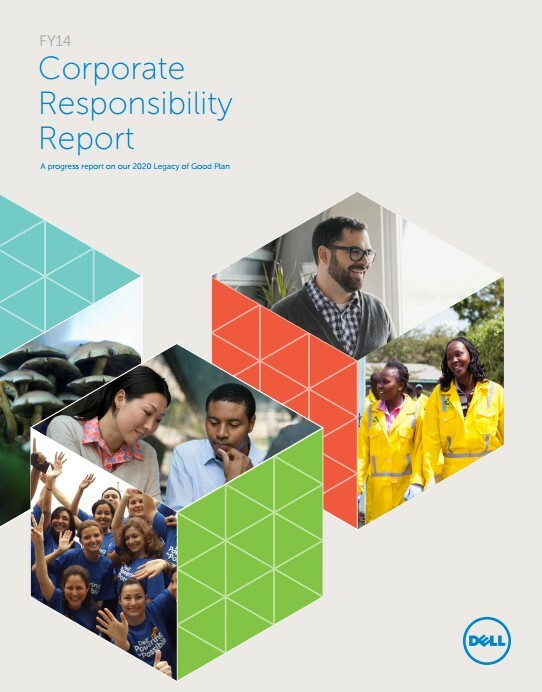 Dell’s Corporate Social Responsibility Report: In 2013, Dell announced its 2020 Legacy of Good Plan – 21 social and environmental goals that guide how the company will use Dell technology and expertise to do the most good for people and the planet. It now produces an annual Corporate Responsibility Report which documents its progress against these ambitious goals. I’m very impressed by the authentic tone of this publication, which not only touts Dell’s accomplishments, but also the areas where it needs to improve. It’s a beautiful piece that does an excellent job of telling the story of Dell’s commitments to the communities it serves and to the environment.